A very important indicator in the area of precious metals is the „Gold/Silver ratio“ which determines the actual ratio between the price of gold and silver. At the present time this ratio has the value of 60:1. That means that theoretically for one troy ounce of gold we can buy 60 ounces of silver. This ratio however, does not even closely resemble the present supply and demand for silver. Historically (that is over several thousand years) this ratio was around 15:1. 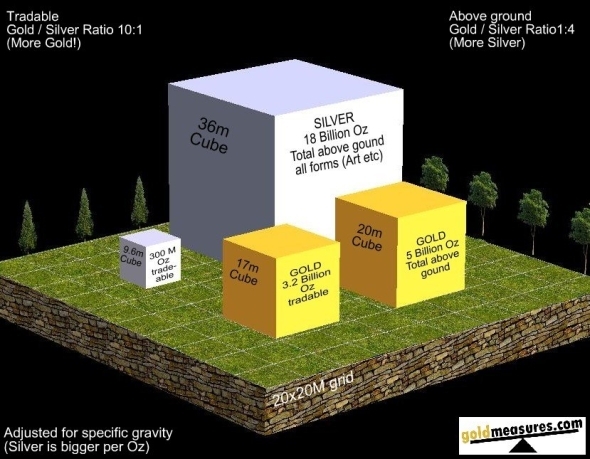 It is interesting that this number much resembles the actual ratio of gold and silver in nature (that is, in the earth’s crust), which is 17:1. In the last article we said that in the last century silver has decreased in volume considerably and the volume of gold is increasing. So how much gold and silver is actually available? The following schematic diagram gives us a good indication. As we can see, throughout the world today in various forms (including artefacts etc.) there is only about four times more silver than gold. If we limit ourselves to metals which are actually available on the market, we discover an interesting thing – there is less silver than gold! Yes, if we compare physical gold and silver, which we can now buy on world markets, then there is actually ten times less silver than gold! How is it possible then that today’s prices of silver and gold do not represent this ratio? There are several reasons. The main being the manipulation of the price of silver on the commodities futures markets, especially COMEX. Here business is in paper contracts for silver, which are sold in greater quantity than actual physical silver exists. The other reason is certain undervaluing or misunderstanding of silver in the eyes of the ordinary people. From the time when silver stopped being used as a metal for coins, economists and analysts from various stock markets have tended to see silver as an industrial metal instead of a precious metal. That is why the majority of people see silver as less valuable, and they associate „monetary metal“ with only gold. This "myth" is not based on the truth. 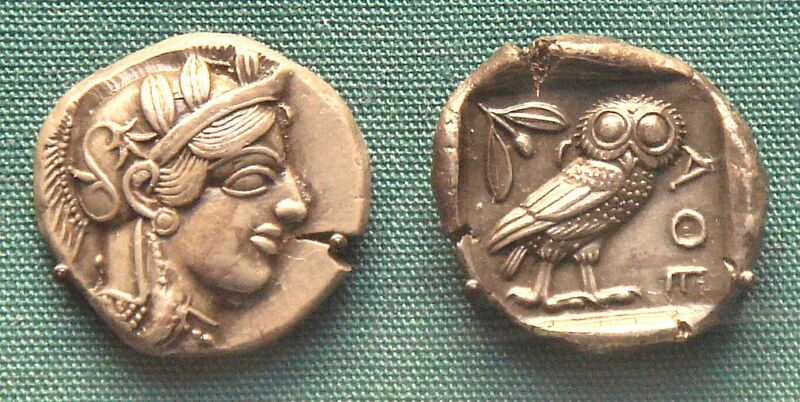 Historically it was mainly silver which was used as a monetary metal, not gold. The reasons are practical – there was more silver, it had a lower value and it was well suited therefore to the barter of goods. Gold was hoarded by the richer echelons for the preservation of riches. That’s why the Gold/Silver ratio throughout history favoured silver. Even the American dollar was defined as approximately 400 grains (27 grams) of silver, in the year 1792 (Coinage Act). So not as a paper made from cotton cellulose, covered with a nice green print. In countries such as India, China, in the oil states of the Middle East, in Mexico and generally in many countries in Asia, silver is perceived as a precious metal. These countries are now getting rich very quickly. We can expect this trend to continue. That will continue to increase the demand for silver. That will further increase the inequality of supply and demand. The "Silver deficit" will increase. USA and the countries of Europe will not be able to indefinitely support the burden of huge debts of the public budget – inflation will take place, maybe even hyperinflation. We are certain that these facts will radically alter people’s opinions of precious metals, in the developed countries. The winner, from a rational and practical point of view, will be silver. Silver, which will again be seen as real money and not subjected to inflation.